PristineHydro™ has a team of experts that are dedicated to testing water quality in many regions for the benefit of society. Most people rely on their towns to provide clean and safe drinking water. Recently, not everyone has the fortune of having quality water to meet their home needs, so everyone should count their blessings. Water quality can vary by location. It is important to understand where water supply comes from and if there are any impurities that could lead to risks. According to the Centers for Disease Control and Prevention, everyone should be using purified water for basic home needs like drinking, freezing for ice, making coffee, showering, washing hands and brushing teeth. However, water quality means more than health hazards. Water can contain calcium and other mineral deposits that create hard water. These items are harmful to health and need to be removed before use or consumption. This can be accomplished with a whole-house filtration system (http://www.pristinewaterfilters.com/), which means all of the water used in the home from the dishwasher, washing machine, kitchen sink and showers will have pristine filtered water just like would be purchased from the local grocery store. Part of improving the water quality is understanding the source of water. It is important to identify the source of water and work to protect the local environment. 1. NO DUMPING – materials dumped down storm drains flow directly into local lakes and rivers. 2. CLEAN UP AFTER PETS – pet waste contains potentially harmful bacteria if it enters waterways. 3. USE NON-TOXIC PRODUCTS – water treatment facilities do not remove all toxins that are found in common household goods. 4. DISPOSE OF TOXIC PRODUCTS CORRECTLY – take any toxic products to a hazardous waste facility. 5. APPLY FERTILIZER CAREFULLY – during rain storms, fertilizer can run off the yard and contaminate local water supplies. 6. DIVERT WATER FROM DRAINS AND GUTTERS – leverage rainwater and divert rain onto grass and landscaping to keep the public drain system from being overwhelmed. Plus, save on water costs. 7. PLANT LOCAL – native plants in the home garden decrease water dependence and reduce the need for fertilizer and pest control. 8. CLEAN WATER FILTERS – filters do not work forever, but cleaning filters will increase their lifespan. 9. WASH WATER CONTAINERS – mix a few drops of dish soap with clean water and pour into water containers. Brush with a dish rag and rinse liberally to keep water containers clean. There are many contaminants found in the water that is being consumed. 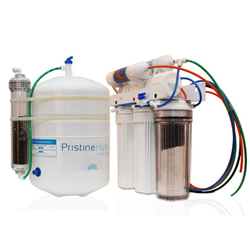 Learn more about PristineHydro's™ 10 Stage Process for their Whole-House Filtration System (http://pristinewaterfilters.com/) and begin removing these harmful contaminants from your drinking water. PristineHydro™ delivers water filters for the home and businesses making healthy water accessible to all at cost levels and form factors. The professionals at PristineHydro™ are highly informed regarding the history of water and how these products can enhance the consumer’s life. It is no wonder so many professional athletes and health enthusiasts are turning to PristineHydro™ for their hydration needs.